Small everyday choices do make a difference. 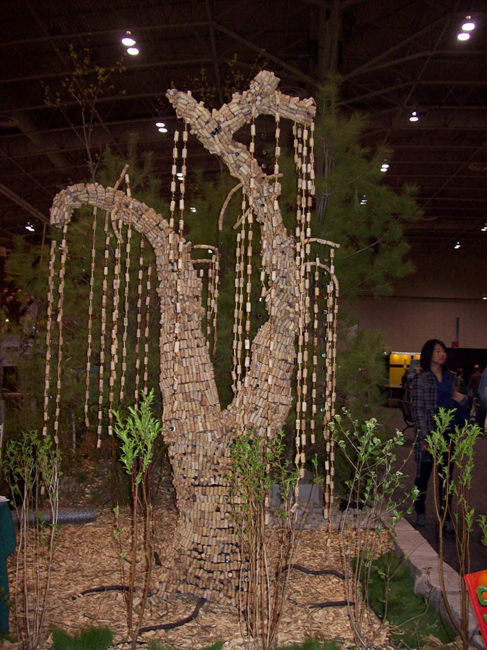 Created from natural and synthetic wine corks, this “Spirits Tree” is meant to illustrate that everyone’s small decisions about re-use and recycling are important. Many small things, when added up, can be monumental. Natural cork, once part of a tree, has been returned to it’s origin in spirit. Viewers are invited to interact with the softly swaying organic “willow” branches and can be entranced by the spirits of this tree. Material Used: Natural and synthetic used corks, fishing wire, re-bar, found objects. Dimensions: 6 feet wide by 6 feet long by 9 feet high. Installation: Indoor, or outdoor on hard surface.